When a user signs out of a view in Dashboard, the user is redirected to the Sign In page by default. The Sign Out window can be customized to direct users to another page within Dashboard or a web page outside of Dashboard. For example, when a user clicks the Sign Out link in the Dashboard banner, you can have your company web site open. This functionality can be set for specific views using the View Builder or set globally for all views by editing a parameter in the WebFOCUS Administration Console. Sign out configurations on a per view basis take precedence over global sign out configurations. Administrators and Group Administrators have the ability to redirect users of a specific public or group view to a different URL upon sign out. Log on to the Dashboard View Builder and select a view. Click Edit Settings. The View Settings dialog box opens. Click the down arrow to the left of Redirects located in the lower-left corner of the View Settings dialog box. The Redirects area of the dialog box appears. Click the down arrow to the left of Redirect Summary. Select context-redirect or x-redirect from the Redirect context type drop-down list, then type the desired URL in the Redirect URL field. This is based on the global Sign Out Redirect URL setting in the WebFOCUS Administration Console. If the Redirect URL field is left blank, the user is redirected to the Sign In page upon sign out by default. Click Save Settings, then click Close. From the Administration menu, select Administration Console. From the navigation pane, click Configuration. Under Application Settings, click Security. 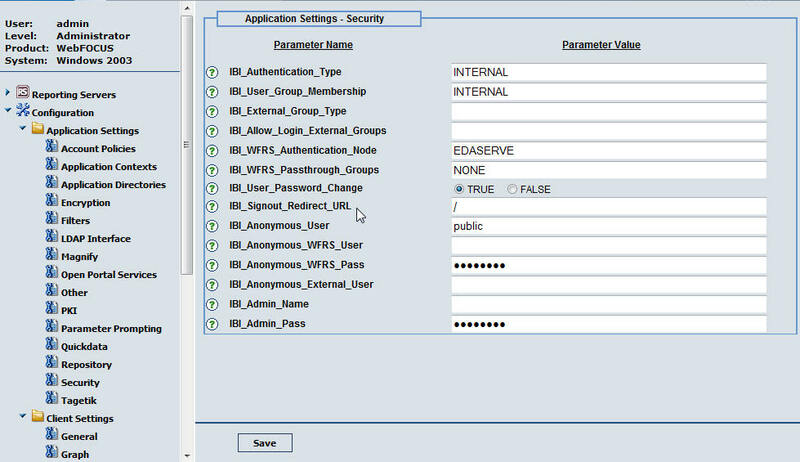 The Application Settings - Security pane opens, as shown in the following image. In the IBI_Signout_Redirect_URL field, enter a valid relative URL or fully qualified URL. By default, all users are redirected to the WebFOCUS Sign In page upon sign out. Click Save and restart the Application Server. Note: The IBI_Signout_Redirect_URL is a global parameter that applies to all WebFOCUS product components.